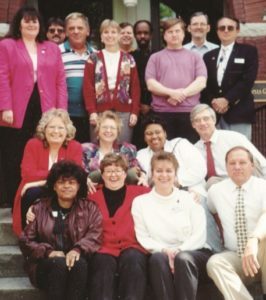 In 1993, Dismas operated 12 residential re-entry centers (RRCs) and three other Louisville-based initiatives – the Alcohol Treatment Program (ATP), the Portland Child Development Center (PCDC), and Robertson House, a facility to serve persons with HIV/AIDS. The re-entry centers included Atlanta North, Atlanta West, Dania Beach, Diersen, Lexington, Louisville, Macon, Owensboro, Portland, Savannah, and St. Patrick. From February 1994 to August 1, 2018, when the Omaha, Nebraska program opened, Dismas has added another 28 RRC’s to the company. in the nation. At left is a photo of a Dismas Leadership Conference taken in 1992 at The Carrigan center in Louisville. Front row from left are PCDC Director Esther Robinson, Secretary Kelly Williams, Louisville Assistant Director Karen Higgins, and President/CEO Ray Weis. Second row is Portland Assistant Director Paulette Wachtel, Diersen Director MaryLou Simmons, Atlanta North Director Gladys Scott, and Robertson House Director Bob Abell. In the last row from left are Louisville Director Faith Good, Dania Beach Director Jeff Poole, Owensboro Director Gus Gesser, Executive Vice President Jan Kempf, Consultant Paul Troutman, Dania Beach Assistant Director, Chief Financial Officer Steve Clark, Macon Director Don Hawley, and Portland Director Larry Fields. The phenomenal growth of Dismas can easily be seen when comparing the photo above to the 2018 Leadership Conference below.